Animated series. When Heather and Windshear land on Dragon's Edge, they quickly discover that Windshear doesn't play well with others. Browse content similar to To Heather or Not to Heather. Check below for episodes and series from the same categories and more! -can't catch one little Terrible Terror? Did you happen to notice how smart this thing is? It's way smarter than Tuffnut. There, there! It's headed for Fish Lake tide. It's nice to see those three doing training on their own. Not really like them though, is it? Come on! Come on, little guy! Not so fast, secret squirrel. Whoa, whoa, whoa, hey! What is going on with you three? And why are you all on top of Fishlegs? We decided to take matters into our own hands. -Oh, we must! We must. Guys, Fishlegs doesn't have to tell you unless he wants to. It's his personal, private business. who has been returning my Terror Mails in kind. Yeah! It's fun to make fun of people. Yeah! Now I have to admit, I am curious. you knew where to find her, and you told exactly no-one? Look, guys, Heather is out on her own. She never stays in one place. We knew we'd hear from her eventually. Yeah, but she and I have that connection. She should have written to me. Fine, go ahead, read them all. Those are some depressing Terror Mails. I may need a mace to the head just to cheer me up. These letters don't even sound like her. She seems worried and confused. Think about everything she's been through. The only family she ever knew - gone. And being out there all alone, by herself. finding out her brother is one Dagur the Deranged. Yeah, I can't say that I'd feel any different in her shoes. Hey, Heather's risked her life to fight with us. She's helped us save countless dragons. She's the closed thing to actually being one of us. It just seems like we should do something to help. Well, hey, what about making her one of us? Ask her to be a Dragon Rider? Ooh, Hiccup, I think asking Heather to join the Riders would be amazing! and Windshear could be a huge help. Well, I think it's a terrible idea. An awful, dreadful, unfathomable idea. Very funny. We're trying to have a serious conversation here. So I am. Look, you don't just get to be a Dragon Rider. most disgusting and often insane dragons out there. How many times have we almost gotten killed doing it? like she's one of us? Doesn't seem fair to me. And besides, who said she'd even want to be a Dragon Rider? You know, it's not for everyone. I myself have had moments of doubt. Hm, you know, Tuff's right about all of it. Well, let's invite her to the Edge, just for a couple of days. To hang out, see how she's doing. Maybe she helps us redirect those Nadders. But nothing permanent happens without us all agreeing. I saw her from my rock garden. Looks like the future Mrs Lout might end up being the future Mrs Legs. bookworm, Gronckle-riding dragon geek over a real Viking? She told me, last time she was here. Hey, you! We thought you could use a couple of days to rest up. Thanks, Hiccup. I really appreciate this. Thank you so much for the letters. Hey, we should sing the Dragon's Edge welcome song! Tuff, we don't have a Dragon's Edge welcome song. Sure we do. It's very catchy. and there's sort of a dance that I do along with it. Yeah, I think Heather would rather set her gear down and get settled. -I'd love to hear your song later, Tuff. Oh, Heather, you're going to love it. And now I have time to warm up. You know, you could've come back with us in the first place. You just disappeared - we didn't know what happened to you. but I knew that you guys would just try to get me to stay. Sometimes you need to be by yourself to figure things out. Your letters to Fishlegs seemed like you were struggling with a lot. -We were all worried about you. We wanted to know what was going on. All that time with Dagur - we were playing a part. that he is actually my brother. Maybe you shouldn't think about it, then. What if I have that berserker insanity inside me? What if, deep down, I'm just like him? Heather, you are nothing like Dagur. we would've dropped you in a volcano a long time ago. So, let's talk about something less depressing. -Astrid, life is too short. You need to express your feelings. And I could say the same to you about a certain pen pal? You two have practically worn out our flock of Terrible Terrors. Oh, my Thor! What is that smell? Dinner - I was hungry. I figured you guys were too. Uh...this isn't chicken, right? Cos I don't do chicken. Those are yak chops, the other OTHER white meat. I'm in. Who's hogging the gravy? Uh, gang, sorry to tell you, but we've got more Nadders incoming. the worst of Dragon Hunter territory. We've been herding them away and diverting them to a different route. but at least they actually arrive safely. Heather, you and Windshear could come with us. We can sure use the help. Windshear is still tired from the long trip. We'll only slow you guys down. Maybe...Meatlug and I should stay behind and keep Heather company? Hey! I can keep Heather company. Everyone says that I'm a great company keeper. -Who has ever said that? So...how about a tour of the Edge? I was a guide back on Berk, you know? -And lead the way I shall. it makes it very convenient to get from the top of the Edge down here. -Should we try it out? Besides, lots to see and not a lot of time to see it. Whatever you think, I'm all yours. OK, so this is the place I picked out to build your hut. but Astrid can get a little bossy. You'll probably want your own place. I'm not sure we want to build anything permanent quite yet. you picked out a really nice place for me. Whoa, what happened here? Why are these two fighting? I don't understand, Meatlug loves all dragons. turn into the green monster. Uh, she's jealous. Is that not obvious to everybody else? Oh, please, that's ridiculous. Why would she be jealous? Did you see Meatlug's face when we were reading those Terror Mails? That, my friend, was the face of a woman's scorn. I knew this wasn't such a good idea. Uh, what wasn't such a good idea? -Meatlug just went after Windshear. But is Meatlug OK? Can she fly? Let me guess, more Nadders? Heather, we could really use you. This is a big flock that's coming in. Windshear will be fine, we'll keep an eye on her. Hiccup, let me take the lead on this. -They're more likely to follow one of their own. and make sure there are no stragglers that break the herd. Coming in hot, low and offside! Guys, small pack breaking off. I guess that throws your green monster theory out the window. Hiccup, we're not doing you guys any good here. Heather, it's fine! Sometimes the dragons just get a little skittish. No, I've seen her skittish - that's not what this is. I'll see you guys back at the Edge. I have to figure out what's wrong with my dragon. OK, guys. Nadders first, then we deal with Windshear. Please say wall of fire, please say wall of fire. Now let's get them back on course where they'll be safe. Look, we've flown hundreds of missions. This was Windshear's first one. You should've seen Snotlout when we first started. He couldn't fly ten feet without somehow setting himself on fire. Did I hear my name? Were you guys talking about me? I know you were. I'm going to be in my hut, it's got a great view. We just need to get Windshear some training. get her used to what it's like to work with other dragons. I think I just need to keep her away from other dragons while we're here. if you become a Dragon Rider. Heather that's part of why we asked you here. Just let me work with you guys. You see? Nothing to it. Let's try a good old-fashioned wingman formation. and play the part of Windshear's wingman. We're here for cover - if anything comes up beside or behind you. You and Windshear take our wing. Ugh, I am! Believe me. I have to get to him. You got to help me out here. There's not going to be a tomorrow. -Clearly, this was a mistake. We just don't fit in here. Besides, do you really want to do that to Fishlegs? and someone is going to get hurt. It's just better if we go. Just going to take a knee for a second. Fishlegs, I wish I had a choice. You can choose not to go. Windshear doesn't belong with other dragons. I'm not going to choose all of you over her. But you haven't even given it a chance. Hiccup is the best dragon trainer there is. I've seen him do things I never thought were possible. You have to give him a chance. I mean, when Snotlout first started out, you should've seen him. I know you were. I'll be in my hut if you need me. It's got a great view, come check it out. I appreciate everything you've done for me. Really, I do. I don't want to go back to being long-distance Terror Mail pals. protecting me and watching over me. That's all she knows how to do. Windshear was just trying to protect you. I know, I wish it were different. OK, girl, let's get to work. he's missed all the super fun Nadder herding? He's saying goodbye to Heather. I'm just saying we could use the help. Yeah, especially with that dragon ship coming towards us. and decided to head us off. It's only one ship. We'll take care of them no problem. but that isn't exactly the case. OK, guys, let's get above the clouds. Come on, Hooky. It's just a little rope. That's not just a rope. It looks like it's made of some kind of reinforced steel or iron. That's what I said! Come on, Hooky. made out of some kind of reinforced steel or iron. Windshear? What are they doing? Doesn't matter. Right now I'm just thankful they decided to show up. Heather, go in closer. I'll stay right behind you on Windshear. As long as she's near you, she'll protect you. It doesn't matter what dragon you're on. Her switching dragons was the trick. Windshear is going to do what comes naturally. You'll get used to this Heather. Dragon Riders, let's clean this mess up once and for all. OK, I have to know. Is this a goodbye dinner, or welcome to the team dinner? It's not a goodbye dinner, Fishlegs. I thank you, and my palate thanks you as well. You know, Fishlegs really deserves all the credit. Stop, you - you're embarrassing me. Yeah, we'd be back to eating Ruffnut's cooking. And can I get some more of those green thingies? -Beans, Snotlout. They're called beans. It's from Dagur. He's been looking everywhere for his sister. And he wants our help in finding her. Well, that shouldn't take long. She's right there. I knew he would come looking for me. If you're not ready to found, we'll make sure you won't be. 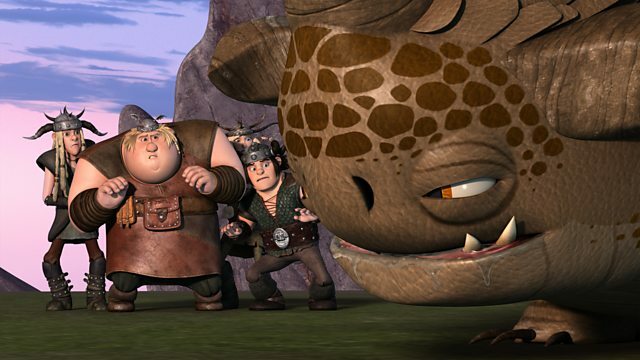 Animated series based on How to Train Your Dragon. When Heather and Windshear land on Dragon's Edge to join the Dragon Rider crew, they quickly discover that Windshear doesn't play well with others.